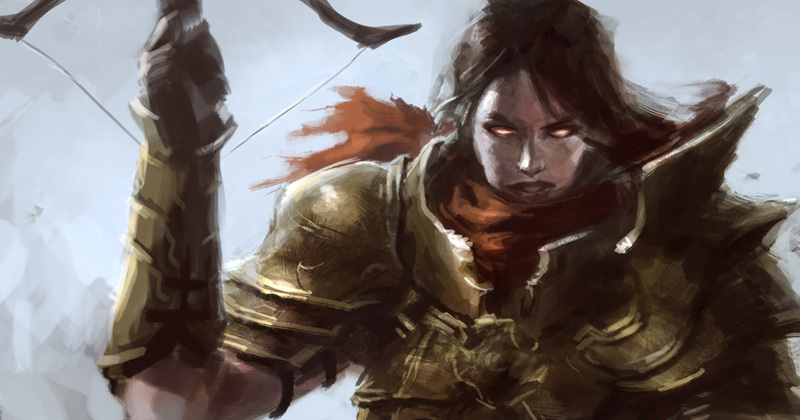 Diablo 3 demon hunter digital painting tutorial and step by step images. In this tutorial, you will learn to paint from Video tutorial along with step by step images with instruction. 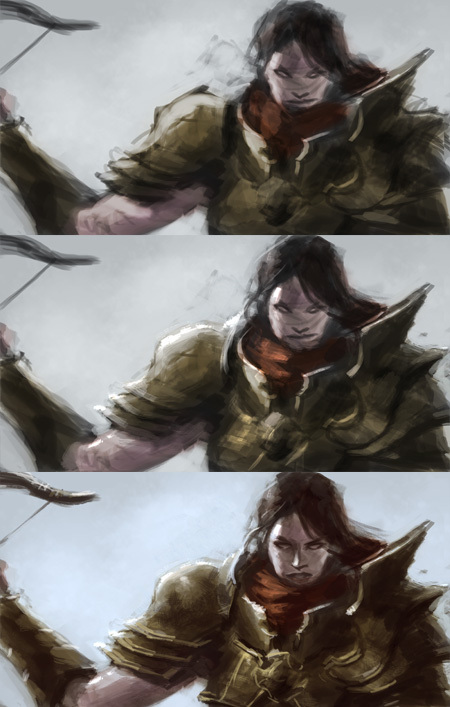 This is another speed painting inspired by a Diablo 3 Demon hunter video demo I saw a couple weeks ago. What attracts me to the character is that the dark mysterious vibe. It looks very cool so I feel like I have to do my speed painting version of the Demon Hunter. For this demo, I use Photoshop CS5 and Wacom tablet Intuo as a painting tool. Here is a description of a Demon Hunter class in Diablo 3. They call themselves the demon hunters, a group of fanatical warriors sworn to a single purpose: the destruction of the creatures of the Burning Hells. The demon hunters number in the hundreds and make their home in the Dreadlands so that they can live and train without the interference of any nation that would worry over having such a fearsome group camped within its borders (though at any time over half are dispatched across the world like this girl, seeking hellspawn). There is something in all demon hunters that gives them the strength to resist the demonic corruption that would drive lesser men to madness. They hone this power, for their resistance to this taint enables them to use the demons’ power as a weapon. But their mission and their power are not all that bind them together. As usual, I start out with scribble lines to find the pose. Then I established shape or silhouette and along the way I also try to get the lighting direction on top of it. When I figured out where the light source is coming from, I will establish basic value all around the painting. Once I have the basic value in place or close, I will then refine it more and make sure that it is as correct as it could be. 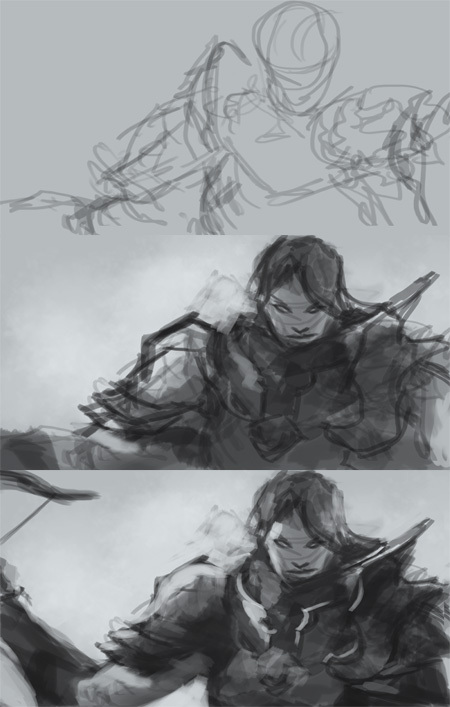 Then I will start apply color and paint over the value sketch. As for using custom brushes, do not worry so much about what kind of brushes I am using. Just focus on what kind of edges will the particular custom brush produces. There can be pretty much three types of edges from using your brushes, not more. Custom brush strokes can give you hard edge, soft edge and lost edge so you have to know how to utilize them. Thought there are custom brushes that will give you like a stamp on result like tree brushes, leaves, etc. Those are totally in the different category because they will give you actual silhouette of objects. – Character design tutorial Knight concept art. – Character design tutorial Warrior concept art. – Advance digital painting tutorial. Paint tool Sai should be able to get very close to it. There are simpler tutorials on the site, look around for easier ones. Good luck. Outstanding work you have going on here man really nice stuff. I have a few questions about the demon hunter you did up here, what is the layer layout you used on this piece? I believe you mentioned that you used overlay to paint the hunter, did you use a normal layer to paint the detail ontop of the overlay? Thanks for your time and for all the feedback. for similar tutorial look under “Art Tips” category. Hi, could you send me the link of how to paint using overlay? Thanx! version of that color? Or just use the b/w as your shadow/hilight basis? 3) How to choose a skin color (cool or warm)? 4) I noticed in the shadows in her face, some were a muddy brown color, and some were what looks like a darker version of the actual skin color. How do you know when to use what? just lighten the color itself? I noticed if transparency is used (easier) you can get that icky dividing line when you go over around the same area w/another pass. 6) What is your layer setup with this? Is it the b/w on one, color on one, hilites on one? And are the layers set to modes or the brushes? I think you said you use Screen? i urge u to please upload a tutorial that mentions about the opacity and flow you use while u do speed painting ,,,,what type of brush u uses to give this cool edge to the paintings,,,,lots of appreciation for ur work man…! !